Have we reached the limits of understanding and protecting water as a resource and how to embed water protection into our social DNA? This map by the Great Lakes Environmental Assessment and Mapping Project illustrates the state of the lakes. We have never known more about water’s quality and quantity than now, yet the state of the lakes is collapsing. Knowledge about water as a ‘resource’ has developed important metrics to guide policy, literacy, and advocacy. Yet the connections needed for greater public engagement and political leadership are broken. Protected solely as a resource, water is threatened most by our collective denial that water is much more -- it is also the source of many vital relationships. The Water Friendship Project aims to name these relationships, present their value and role in water protection, and offer concrete actions to guide water policy, curriculum, and advocacy. Additionally, uncovering lost connections to water can connect people across different cultures, professions, and locations. One of the major challenges facing the Great Lakes is their size. As the source of 20% of the world's surface freshwater, they are home to 40 million people and divided by over 1,000 laws, boundaries, cultures, agreements, jurisdictions, and protocols. This Project follows the logic of water itself. We are all connected by water and by re-discovering and sharing our relationship with water, we are also building unity and a sense of belonging across and within watersheds. Workshop co-facilitators Paul Baines and Tanya Chung-Tiam-Fook worked closely with a key contact in each location. This community liaison position lended legitimacy to the project, while connecting us with all the participants. 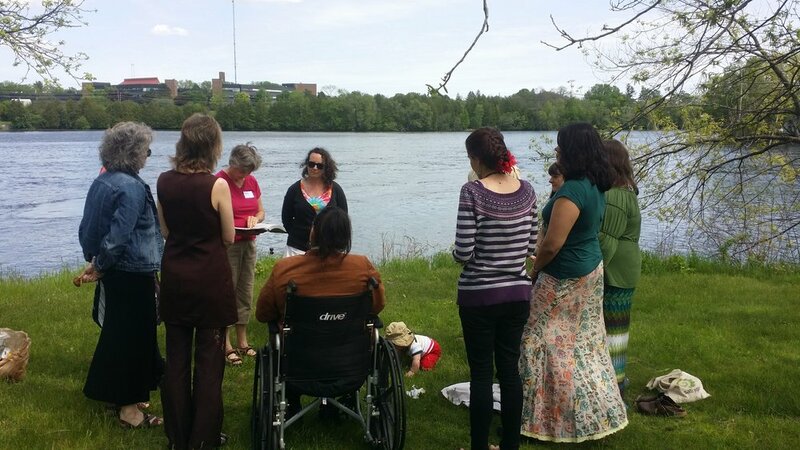 We worked with Dorothy Taylor (a cultural teacher from Curve Lake First Nation) in Peterborough, Betty Carpick (a community-engaged artist) in Thunder Bay, and Karen Rathwell (a member of Wellington Water Watchers) in Guelph. The goal of the workshop was to introduce the need for a more relational understanding of water, to generate ideas (or ‘indicators’) that animate these key relationships, and to initiate a process for local follow-up on a community project. 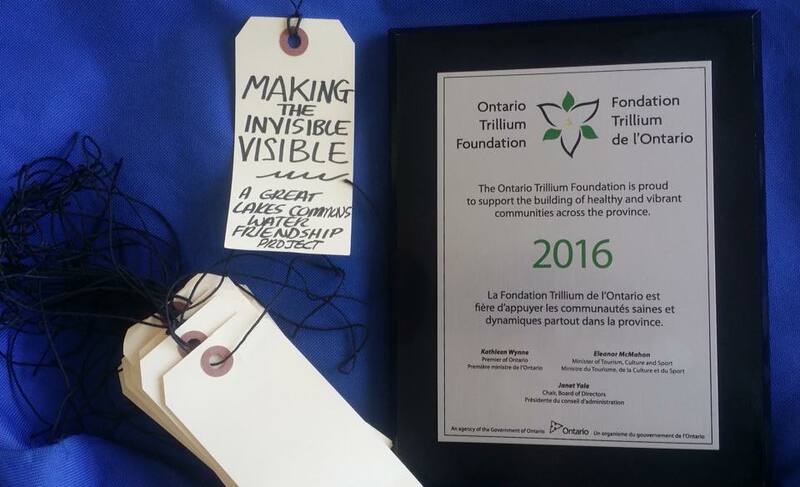 This seed project (funded by the Ontario Trillium Foundation) created new directions in water protection and social connection. Rather than just trying to protect water, participants wondered how to also protect the key relationships they have with water. This infographic offers a summary of the main ideas, however there is still much more to process as this project evolves in 2018. Get in touch if you would like to collaborate. This innovative seed project included support for each community to implement a project that animated the water friendship ethic. Each project was designed and supported by the workshop participants of that area. Each of these projects reflect the uniqueness of the of the area and those involved. The group also printed 1,000 stickers illustrating our place and responsibility in the water cycle. With a donation to the Onaman Collective, the group got permission to use Christi Belcourt’s image seen within the images below. These stickers were given to all Adventures in Understanding paddlers and were shared among the workshop team to re-distribute as gifts across their social networks. 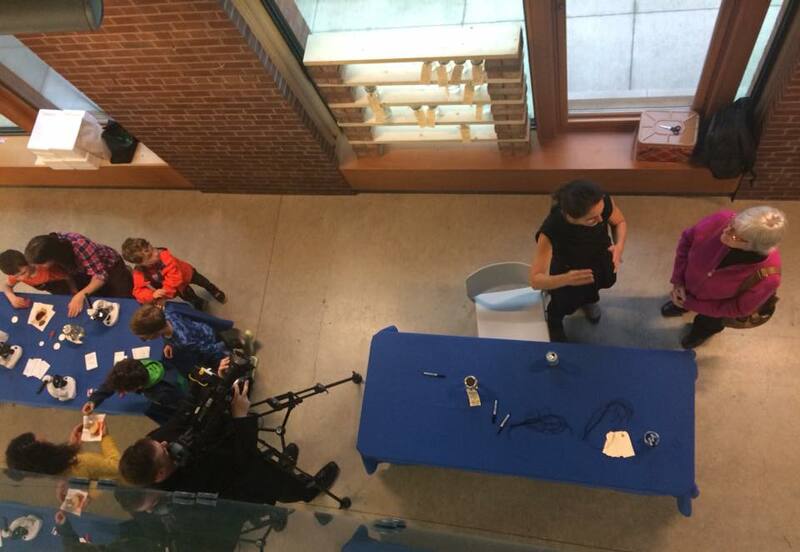 At the Baggage Building Arts Centre, the Thunder Bay team organized a public event for people of all ages to celebrate water friendship and share their connection to Lake Superior. 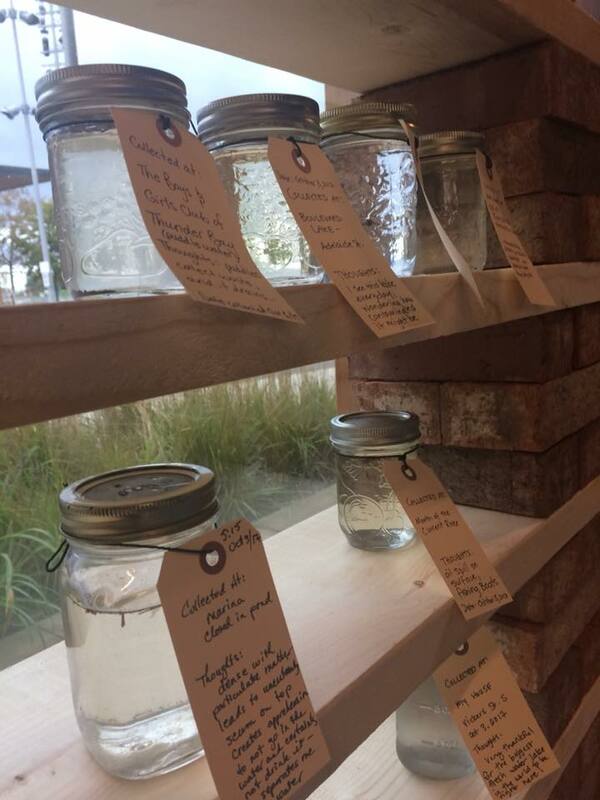 Participants brought water samples in Mason jars from the Thunder Bay watershed and each jar was labelled with the collection date, location, and thoughts on why the water sample was significant. As part of the cataloguing, samples were examined under a microscope and a mini-zine provided information about aquatic invertebrates A map of the watershed was available for indicating collection areas and it hung alongside a summary of the water friendship teachings. Stimulating even more senses, the event featured live music with a water theme and local, seasonal food. As the title suggests, this event showcased our water connections to place, non-human life, sound, taste, and knowledge for a week-long art installation just a few hundred meters from Lake Superior. This group wanted to stress the need for greater ritual and gratitude for water and the role children play as leaders in water friendship. Guelph has been home to monthly Water Blessings events hosted by the Wellington Water Watchers. The Water Friendship Project supported some of the promotional and organizational costs for these gatherings for the fall and winter. Read about the September blessing in this article. The promotion for the gathering explains, "Full Moon Water Blessings provide opportunities for the public to gather to appreciate and celebrate the magic and majesty of water by joining together and reflecting upon the importance of water in our lives." What’s Next for Water Friendship? 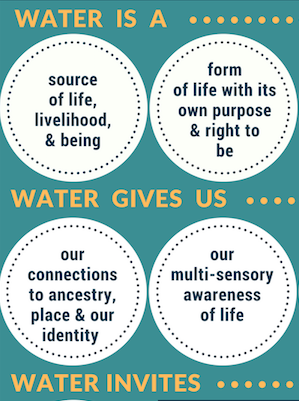 The community projects and the infographic are only a few examples of how to use the Water Friendship teachings to describe and to protect our relationship with water. We are sending this report to all our workshop participants to honour their contribution and reseed new energy for 2018. We will reach out to Great Lakes Commons supporters and other water organizations to promote the Project’s findings and demonstrate how water protection enriches our relations between people and place. The Trip Guide produced by the Peterborough team has been adapted for a canoe trip at Champlain College (Trent University) and the Guide’s map has been adopted by 2 other education projects. The art workshops in Guelph will serve as a precursor for additional workshops on water friendship and a World Water Day event showcasing the student art. We will share this work with the Canadian Index of Wellbeing to initiate an update to their indicators of environmental quality. Laura Gilbert, a graduate student from McGill University will study of how the teachings can be used to make recommendations to policy and curriculum. You can also look forward to a more complete guide to the water teachings and more ideas of how to apply them in your work. Get in touch to explore how this project can support social and environmental connections in your work. What do you think/feel were the most valuable parts of the workshop? I had never taken part in a water blessing before and I found that really interesting (Kayla). What parts of the workshop do you think/feel could be changed to make it better? Can you share a bit of your experience about how the weekend affected your connections with others in the group and connections to place? I found the experience of co-designing and co-facilitating the Water Friendship workshops in the three communities to be unique and profoundly moving. With the workshops, we were interested in providing an innovative yet supple frame for connecting diverse groups of water protectors in a holistic process of collaborating, visioning, designing and animating change related to their relationships with water and water actions. I immediately felt that participants were eager to look beyond the more instrumental and scientific qualities of water, and instead, open their minds and hearts to a deeper level of awareness and engagement with water. In fact, there was a lot of interest in exploring water as a sentient, rights-holding and even mystical entity that we feel kinship with in our daily lives. Despite their different professional and cultural perspectives, most people were able to really drop into more holistic and qualitative ways of thinking about, appraising and animating their relationships with water and water practice.